Spinal decompression therapy is a non-surgical treatment for spinal disorders including but not limited to herniated or bulging discs in the neck and lower back. Back, neck, arm or leg pain may be helped by spinal decompression therapy as part of our therapy program at our Toronto clinic. How Many Spinal Decompression Sessions Are Needed? The number of sessions needed and your specific treatment plan will be determined by Dr. Kris after your initial examination. What Type of Decompression System is Used? 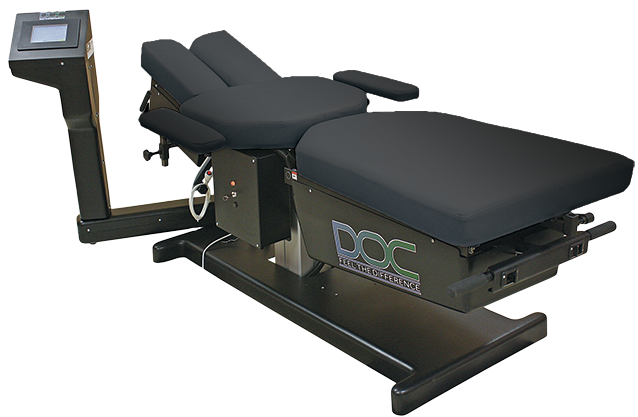 After a significant amount of research, our office chose the DOC Cervical/Lumbar Spinal Decompression Table. More importantly, we have the brand new computerized system which is arguably the most sophisticated and advanced decompression technology in the industry. Dr. Kris’s comprehensive training and the table’s computerized 3 dimensional traction system’s technology are the keys. Proper assessment, correct positioning and the use of detailed human movement patterns of distraction and relaxation reduces disc pressure. This allows necessary nutrients to enliven and accelerate disc healing and contributes to the imbibation process. Imbibition is when blood and nutrients are absorbed into the spinal discs consequently making the living tissue stronger and healthier. Anyone who has back pain or neck pain from an assortment of causes, including but not limited to damaged discs and injured facet joints, may be helped by spinal decompression therapy. These conditions include herniated, protruding or bulging discs, spinal stenosis, sciatica, non-specific mechanical low back pain or even failed surgery. The specific treatment plan will be determined after your examination. The best results have been achieved using 15-20 sessions over a 4 to 8 week period. What is the Cost of the Therapy? Our customary fee for each spinal decompression session is only $50-70 which means the total cost will be a small fraction of the $3000 -$5000+ amounts that some offices are charging. YES! Some insurance plans provide coverage for the cost of our spinal decompression program. Our office works with most insurance companies and networks. We offer many modalities covered by insurance providers for services of chiropractic, physiotherapy and registered massage therapy in our office. Reimbursement varies but your out-of-pocket expense for services could be very little to none. For insurance related questions, ask us to help you find out the right information for you when you come to the office. To reduce inflammation and assist the healing process, supporting structures are treated with passive therapies (ice/heat/muscle stimulation), nutritional advice, spinal mobilization (as indicated) and/or active rehabilitation in order to strengthen the spinal musculature. For patients interested in fixing back issues and want an effective treatment plan, we offer a complementary initial assessment which includes in-house X-Rays, and provide a detailed Report of Findings which includes reviewing any X-Rays taken and previous MRI or CT scans. Core Wellness Centre located on St. Clair Ave West in Toronto offers physiothearpy, RMT registered massage therapy, treatment in the cases of automobile accidents, chiropractic care, cold laser therapy (LLLT), treatment if one has had a slip and fall injury, vibrational therapy and has on-site x-rays available (if required). We want to make it easy for you to learn if you are a candidate for spinal decompression therapy as part of our specialized spinal care program. Just call our office at 416 479-8311 and speak with Conie to arrange a consultation with Dr. Kris Dorken. Please remember to bring any MRI films and reports so Dr. Dorken can review them and best advise you about your treatment options. Please get in touch with any questions you may have! Fill in the form below or call 416 479 – 8311.